I was not familiar with the work of Miranda July before I saw The Future. She is a filmmaker, performance artist and short story writer. Her work has provoked sharply divided reactions from people. Some critics have dismissed her work as shallow and empty, while her defenders say that her work is “whimsical”. This a word that makes me wary. Americans are not good at whimsy. When Americans try to be whimsical, the results are usually abominations such as Forrest Gump. Americans should leave whimsy to the French, who have given us directors such as Jacques Tati and Jean-Pierre Jeunet. The only American director who has even come close to being good at whimsy is Terry Gilliam – and he can be unbearable at times. 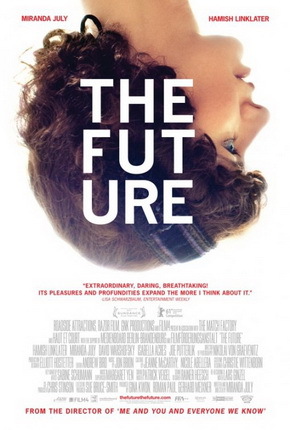 The Future is about a thirty-something couple, Sophie (Miranda July) and Jason (Hamish Linklater). They decide to adopt a cat in one month. They talk about this as something that will change their lives as much as having a baby would. Perhaps this is meant to be a joke, but it isn’t funny; it merely makes them seem vacuous and shallow. They decide that they have one month to “experience life” before their lives become slavishly devoted to a feline. They do this in different ways. Jason gets a job selling trees, while Sophie has an affair with another man. (Clearly Sophie is the more ambitious of the two.) Sophie begins her seduction by calling up a man she has never met – Marshall (David Warshofsky) – and asking him strange questions over the telephone. She then pretends to be a client for his sign-making business. Right away, she leaves Jason and moves in with Marshall and his young daughter, Gabriella (Isabella Acres). Not surprisingly, this arrangement doesn’t last very long. One evening, Gabriella buries herself up to her neck in the backyard and announces that she is going to spend the whole night like that. Sophie tries to talk her out of this (as any human being would), but Marshall says that this is okay. Later that night, an enormous shirt crawls into the house. This clearly symbolizes Sophie’s past life. Sophie puts the shirt on with her legs through the sleeves and pulls it over her head. When Marshall sees her like this, he is shocked and horrified. This is a man who finds nothing wrong with the idea of his daughter spending the night buried up to her neck in dirt, yet he is repulsed by the sight of a woman with a shirt over her head. I guess this is supposed to be whimsical. As for Jason, he has the ability to stop time. (Or at least he thinks he does. The film is not really clear about this.) He also talks to the Moon, and the Moon talks back to him. (Again, this could be imaginary.) Oh, and there’s a talking cat. Since I watched too many Disney movies when I was growing up, the last thing I want to see in a film is a talking cat, especially if it’s a film about a thirty-something couple having a mid-life crisis. It’s interesting to note here that July is married to Mike Mills, whose film, Beginners, which I saw earlier this year, has a talking dog in it. (Well, he doesn’t actually talk. Subtitles appear in front of his face.) So, are talking or semi-talking animals the hip new thing in movies nowadays? Someone please tell me this isn’t so. There are a few surreal moments in this film, as when we see Gabriella buried up to her neck in her father’s backyard. For the most part, however, this is simply a tepid romantic comedy with some fantasy elements and some pretentious dialogue in it. It can safely be said that I am not one of Miranda July’s fans.